For quite a few years I have planned on making this animated advent calendar to countdown to Christmas. But for the past few years I have had too much on to be able to do it justice. However this year I finally decided to take on this challenge, and boy was it one! A couple of weeks ago I went through the Pixilation elements of the Making, this week is Hand Drawn. Hand drawn with fineliners and watercolour painted scene, of House with a wreath and robin flying to it. Combines the ideas ‘Wreath’ and ‘Robin’ in a little animation of a Robin perching on the wreath decorating a front door. 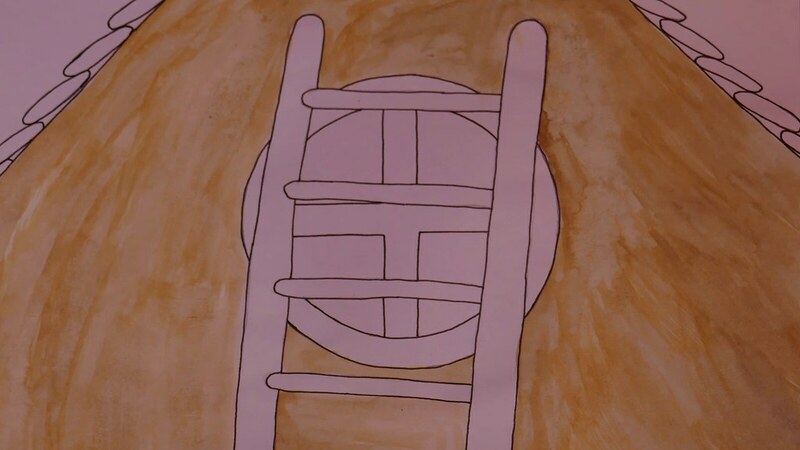 I made this first by painting the back layer of the door, starting with a pencil drawing which I then painted using watercolours and inked over the lines in various thicknesses of fineliners. 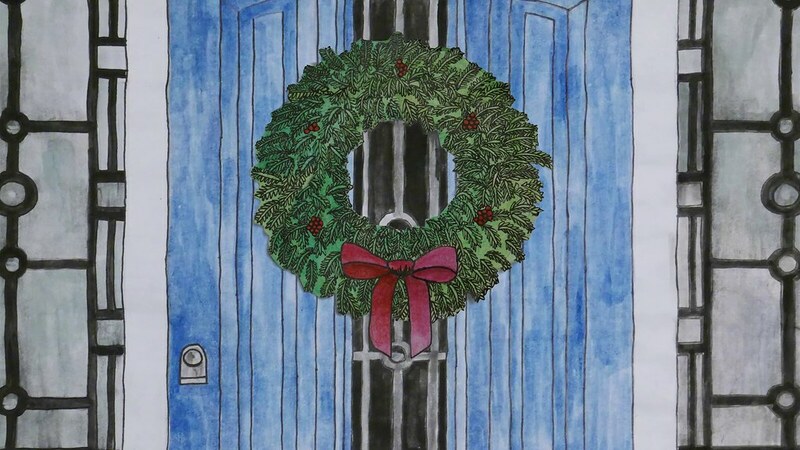 Then to animate the Wreath rustling I drew a few frames of it separately in the same way I did with the door. And finally I drew out the many frames of a bird flying across the screen, for this I followed reference films of birds to try get the most accurate movement of the wings. To put the film together I used layers of these films and edited them in Adobe Premiere Pro. The composition worked really well as each part of the animation molds together. I also added in the song ‘Heavenly’ by Aakash Gandhi from the music section of the YouTube Audio Library. 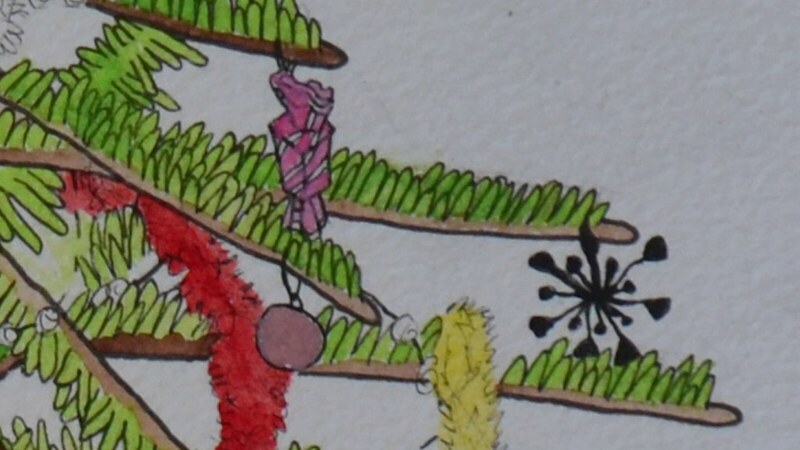 Hand drawn with fineliners and watercolour painted scene, of Christmas Tree and Ornaments. Brings together the Christmas Ideas of ‘Christmas Tree’ and ‘Angel’ by panning around my Christmas Tree. I drew out this piece as a large A3 drawing, using a photograph from last Christmas. Drawing out in pencil then inking with Fineliners and colouring with watercolours, in keeping with the handmade Christmas Card feel I want for this project. I then photographed this wider shot and edited the panning around the decorations in Adobe Premiere Pro. This therefore gave the camera the smoothest movements possible with the equipment I have. I then added the song ‘O Christmas Tree Instrumental’ by Jingle Punks (as of course this is the most appropriate song for this animation) from the music section of YouTube Audio Library. Hand drawn with fineliners and watercolour painted scene, of Gingerbread House with a Gingerbread Man. Door Fifteen: Incorporates the ideas ‘Gingerbread Man’ and ‘Star’ as we see a Gingerbread Man putting up his Christmas Star on his Gingerbread House. This started as one of the strongest Hand Drawn pieces of this project as I drew out all the frames for these movements. However I started to run low on time and so had to rush some of the colouring and so only managed to get the gingerbread colours. I did debate going without colours but this was better than the plain even if not as colourful as planned for. I captured all the frames then edited them together and added the song ‘White River’ by Aakash Gandhi from the music section of YouTube Audio Library. Hand drawn with fineliners and watercolour painted scene, of Nuts and a Poisettia Plant on this large wooden table. Merges together the Christmas Ideas of ‘Nuts’ and ‘Poinsettia Flower’ in this animation of cracking open some nuts, something that always reminds me of Christmas at Home. Once again I drew the frames out first in pencil then inked with fineliners then coloured with watercolours. 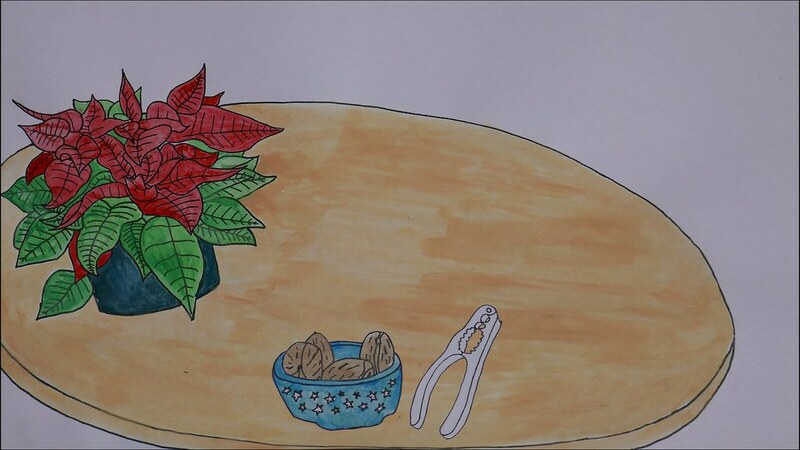 I created the background layer of the table, poinsettia Plant and bowl of nuts and has that animated when one is removed. I then had a separate layer I drew out for the hand movements and nutcracker. This was then edited together with ‘Heavenly’ by Aakash Gandhi from the YouTube Audio Library and the sound effects ‘Cracking of Nuts with a Nut Cracker’ by 15050_Fracois and ‘Muted Thud’ by farbin from Freesound bringing the whole piece together as a ‘tipping hat’ of respect moment for a Christmas memory of mine. 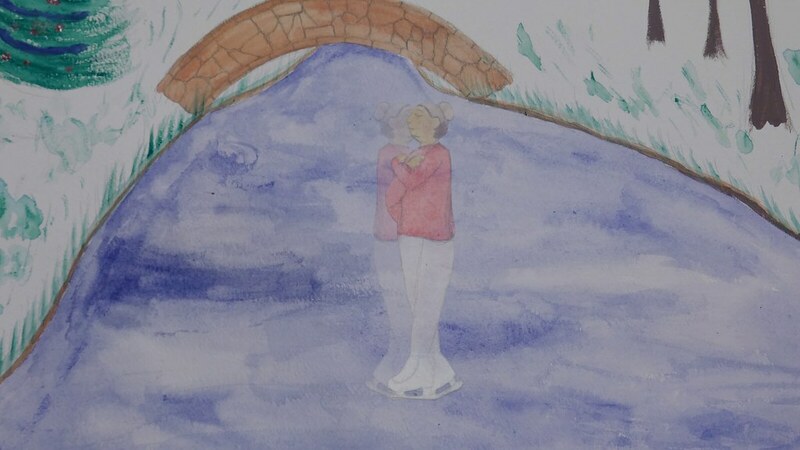 Hand drawn with pencils and watercolour painted scene, of Ice Skating Figure on a frozen river. This is the final animation in the Hand Drawn segments of these Animations, centred around ‘Ice Skating’. Drawing the background with a simpler minimalist look with watercolours and o inked outlines. Used in the top animated layer of the figure skater to have this softer snowy feel to the overall film. Using the song ‘First Noel Instrumental’ by Jingle Punks from YouTube Audio Library. Overall these Hand Drawn Animations have been really interesting exploration of the technique and the different ways in which I can animate these hand drawn elements. 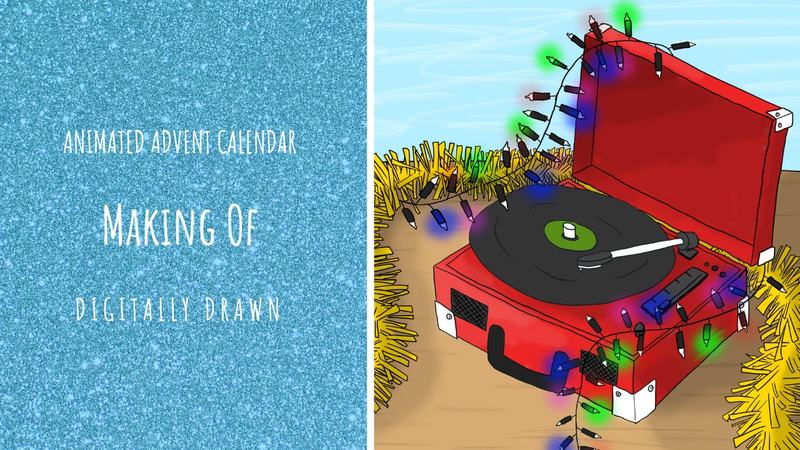 I hope you have enjoyed learning more about the Making Of the Hand Drawn Animated Advent Calendar Doors, come back next week for Digitally Drawn films of Animated Advent Calendar!